We recently posted the main headlines from the Houzz Kitchen Trends Study 2017. For this month’s kitchen trends blog we’re going to take a closer look at a couple of aspects that were covered in that report and look at them in a bit more detail – what drives people to buy a new kitchen and what do they hope to achieve from doing so? There are obviously many reasons why people decide to change their kitchen but the responses given to Houzz would confirm the main reasons that we come across. The biggest reason (42%) is down to moving house. Most people want to put their own stamp on a new home and the kitchen is one of the most popular areas of the house to renovate. For 32% of people it’s down to having the means to do it. A kitchen can be a substantial investment so many will save up for quite some time before taking the plunge or it may be a case of coming into some money or securing a better paid job. 30% state they just couldn’t stand the old kitchen any longer (I think we can all empathise with that one at some stage in our lives!). Maybe it’s a case of the old one getting shabby or having had to live with a kitchen that previous owners put in. For some, they’ve just changed their minds and what felt like an uber-modern, efficient kitchen 15 years ago, just doesn’t work anymore for you! In 26% of cases it’s down to the old kitchen falling into disrepair or even becoming unsafe. Obviously this is something that definitely needs addressing – especially if you have children in the home. Finally, 14% of people changed the kitchen in line with a change in family or lifestyle. Having children and adding to your family can often be a catalyst for change in your home and indeed, the opposite can also be true – children growing up and leaving home. What do you want to achieve by changing your kitchen? So we’ve looked at the why, now let’s examine the what – what exactly do you want to get out of doing it? A new kitchen isn’t cheap and can be disruptive so you need to be clear on your goals and anticipated outcomes – this is a key part of the kitchen planning process. A whopping 63% want to increase the size of their kitchen. This could be by knocking through to another space, extending the house or even moving the kitchen into a different area of the house. 79% said they wanted to make better use of the space they have. 55% wanted better organisation so it’s easier to store and to find things. 36% wanted to be able to utilise unreachable space and 21% said they wanted to make cooking and baking easier and more enjoyable. 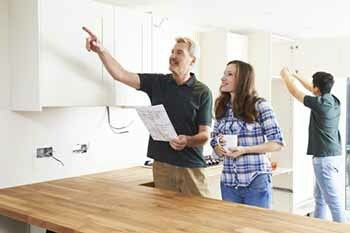 What do people achieve by upgrading their kitchen? This study demonstrates the importance of putting some thought and time into planning your kitchen well and really focusing on what you want to achieve from it. We would imagine that you will probably share many of the aspirations detailed here but your vision will be as unique as you and it’s important to help your kitchen planner to understand this. Looking at the outcomes that people do achieve at the end of it will help to keep you focused on the end result. Many of these will make an impact on your lifestyle that you wouldn’t think could come from something as simple as a new kitchen but the evidence speaks for itself. Buying a kitchen from a professional kitchen consultant, such as our MD Dean Clements, is a very different experience to buying one ‘off the shelf’ and doing it all yourself. Why not book a free kitchen design consultation with Dean so you can see what we mean. There’s no obligation to buy and it really helps you focus your thoughts and understand what’s possible for your budget. To book a consultation, give us a call on 0800 321 3491 or complete our request form. 0 Responses to "Kitchen Trends Blog – March 2017"